Publication: Gen. Sp. Orchid. Pl. 286. 1835. Notes: Taxonomy follows FNA. Closely related to Platanthera macrophylla of northeastern North America (Reddoch and Reddoch 1993). FNA26:"Considerable variation in size and shape of leaves occurs, and although to some extent regional in nature, intergradation is complete; recognition of infraspecific taxa is unwarranted. A few collections from isolated areas on the Pacific Coast of Canada are noteworthy, however. Those are small, few-flowered plants with rather narrow leaves borne alternately or suboppositely toward the base of the stem, as in some Asiatic species. 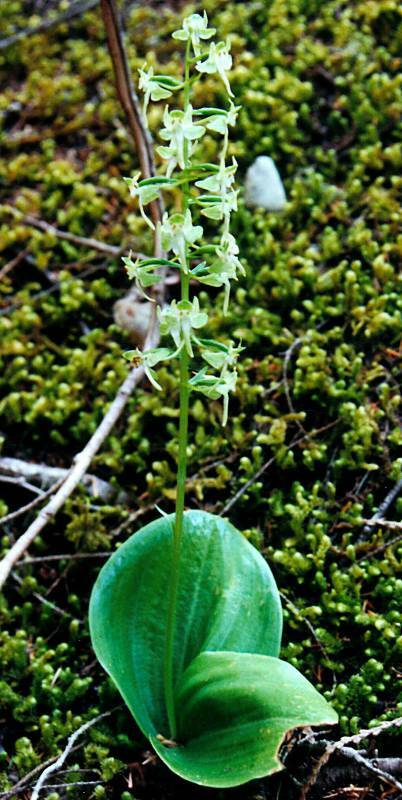 They are in some respects very similar to Platanthera freynii Kränzlin, an Asiatic species distinguished primarily by its abruptly narrowed petals, in contrast to the generally broader, but variable, petals in North American plants. These western plants warrant further study to establish their identity and to elucidate relationships between North American and Asiatic species." » Reddoch, A. H. and J. M. Reddoch. 1993. The species pair Platanthera orbiculata and P. macrophylla (Orchidaceae): taxonomy, morphology, distributions and habitats. Lindleyana 8: 171-187.